Now, comes our modern times with every fad diet, exercise program, supplementation plan and MLM products, hydration by Power Drinks or Vitamin Brews and mental health gurus of every type selling you on meditation, yoga or hiking in the Himalayas to be in contact the Ancient Masters. Here’s the problem: our “staves” are pushed individually very hard by many of these products, plans and concepts. There is never a balance. And, like the wooden barrel, too much pressure on a single stave, our barrel can collapse! Example: too much of one particular supplement “for your liver” can disrupt your uptake of calcium, another might be for a “blood cleansing” which is quietly wreaking havoc on your mental cognition and neuron function. Pushed too hard with one particular supplement, the body may malfunction (begin to collapse the barrel”) and you could end up in the hospital or even dead. About 20 years ago, an MLM was promoting a “Natural Weight Loss Program” by boosting a person’s metabolism. Great idea, except the company was using an old Chinese medicinal herb with natural ephedrine. Several people died…their “Metabolism Stave” collapsed completely. Too much of one thing without balance can be deadly. As in the barrel, the ladder is an ideal analogy for the human body. Here it is best to think of the relative importance of each step or rung in the ladder. To be at the top, one must go to the top rung. The top rung is therefore the most important for your “Reaching Effort” or quality of reaching. The body also has systems which function in a ranking of importance; though none are nonessential (as in the ladder-skip a rung and you may fall or collapse the ladder). In the human body, there is one system which effects every living cell to the point of life or death…eventually death. This system is the top rung, the highest and most important of all: Mitochondria. These very small (10,000 in a single brain neuron) energy extractors collect and process all the food delivered to every living cell, convert it for “Cellular Fuel” and provide our cells with the “Go Power” we need to live and prosper. Eventually, they tire, mutate, die off in numbers and we perish from starvation (and all the related diseases associated with starvation) By the way, we have called this eventual failure Aging for as long as anyone can remember. Therefore, to make the inevitability of death delayed as long as possible, a person needs to learn about the “Care and Feeding” of their Mitochondria. One such product, the first to be marketed in the US for this purpose 13 years ago, is Time Challenger. 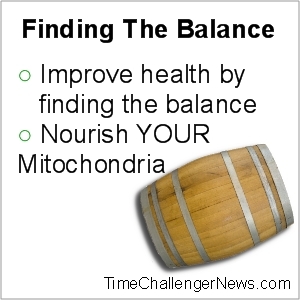 If the Mitochondria are well fed, the body is designed to recover from almost malady. As with the previous examples, The Wall is illustrative of the poor quality of education regarding “Body Maintenance and Repair Products” on the market today. When one wishes to build a wall, there are steps to accomplish if one wishes to have a stable structure. In the human body, building and repairing has to be viewed in reference to a well built wall. One starts with the foundation (Good food and Water), a first course of bricks (selecting which culture and type of nutritional modes you will follow), the mortar (the unifying exercise, rest and mental care for optimum vigor). In the nutritional supplements world today, one often is bombarded with hype for Energy Bars, Power Drinks, Cleanses, Weight Gain or Loss programs, etc, etc, etc. These folks and their products and programs are, too often, suggesting you begin building a second or third course of bricks in your Wall (often without mortar), six feet in the air…metaphorically speaking….without having a clue as to how to build a foundation first! In each case, the first and most important element of these analogies is the proper “Care and Feeding” of your Mitochondria. You cannot live without these living energy extractors, but you can improve their health and therefore their benefit to your cells…translation: every other good thing you do for your body from then on will be even better! Your challenge is to take this message to heart and not as some, all-to-common hype. Thirteen years of customer satisfaction has given Time Challenger the credibility of a Mitochondrial Nutritional product …second to none. A tune up of these systems means an opportunity to elevate your vitality and vigor and restore what life has worn down.